We previously reported on the anti-obesogenic and anti-inflammatory effects associated with n-3 long-chain polyunsaturated fatty acids (LCPUFA) in our diet-induced obesity (DIO) mouse model. Two isocaloric high-fat diets (HFDs; 48 kJ% fat), HFD (HF) and n-3 LCPUFA-enriched HFD (HF/n-3), and a control diet (C; 13 kJ% fat) were used. The underlying mechanisms however have largely remained unclear. Here, we assessed whether the reduced fat mass reflected n-3 LCPUFA-induced expression changes in lipid metabolism of the intestine, liver, and interscapular brown adipose tissue (iBAT), as well as increased iBAT thermogenic capacity. For HF/n-3, saturated and monounsaturated fatty acids were partially substituted by n-3 LCPUFA eicosapentaenoic acid and docosahexaenoic acid to achieve a balanced n-6/n-3 PUFA ratio (0.84) compared to the unbalanced ratios of HF (13.5) and C (9.85). Intestine, liver and iBAT from male C57BL/6 J mice, fed defined soybean/palm oil-based diets for 12 weeks, were further analysed. Gene and protein expression analyses, immunohistochemistry and correlation analyses for metabolic interactions were performed. Compared to HF and C, our analyses suggest significantly diminished de novo lipogenesis (DNL) and/or increased hepatic and intestinal fatty acid oxidation (ω-oxidation and peroxisomal β-oxidation) in HF/n-3 mice. For iBAT, the thermogenic potential was enhanced upon HF/n-3 consistent with upregulated expression for uncoupling protein-1 and genes involved in mitochondrial biogenesis. In addition, a higher capacity for the supply and oxidation of fatty acids was observed and expression and correlation analyses indicated a coordinated regulation of energy metabolism and futile cycling of triacylglycerol (TAG). Moreover, HF/n-3 significantly increased the number of anti-inflammatory macrophages and eosinophils and significantly enhanced the levels of activated AMP-activated protein kinase α (AMPKα), peroxisome proliferator-activated receptor α (PPARα) and fibroblast growth factor 21 (FGF21). Our data suggest that by targeting transcriptional regulatory pathways, AMPKα, and FGF21 as potential mediators, HF/n-3 activated less efficient pathways for energy production, such as peroxisomal β-oxidation, increased ATP consumption upon the induction of futile cycling of TAG, and additionally increased the thermogenic and oxidative potential of iBAT. Therefore, we consider n-3 LCPUFA as the potent inducer for upregulating energy dissipating metabolic pathways conveying anti-obesogenic effects in mice. Obesity represents a major risk factor for metabolic disorders, especially cardiovascular diseases, type 2 diabetes and fatty liver disease [1, 2]. Overconsumption of a ‘Western diet’ - foods consisting high levels of sugars and fats - is a major cause of the epidemic prevalence of obesity . The dietary fat quality influences obesity development, since fatty acids individually modulate the expression levels of several genes and transcriptional factors that are involved in lipid and energy metabolism regulation . It is generally believed that, besides saturated fatty acids (SFA), the n-6/n-3 polyunsaturated fatty acids (PUFA) ratio, which has steadily increased in Western diets, is associated with increasing obesity and metabolic disorders [5, 6], whereas, in particular, animal studies reported that n-3 long-chain polyunsaturated fatty acids (LCPUFA) and/or their metabolites have anti-obesogenic and anti-inflammatory potential, and monounsaturated fatty acids (MUFA) are also metabolically benefical . However, mixed results as well as the lack of consistency and findings across human studies  make it difficult to confirm these observations in humans. In particular, the underlying mechanisms are still not well understood and data from tissues of human studies are very limited. Mouse studies have shown that n-6 PUFA-derived lipid mediators act pro-inflammatory, whereas n-3 PUFA-derived lipid mediators confer anti-inflammatory and pro-resolving actions in inflamed adipose tissue by eliciting macrophage polarization toward a M2-like phenotype  and/or by the reduction of crown-like structures (CLS) rich in inflammatory M1 macrophages in obese mice . Moreover, n-3 PUFA can improve impaired metabolism in obesity by modulating main metabolic pathways in adipose tissue, liver and small intestine in mice [11–14]. In addition, brown adipose tissue (BAT) expansion and/or activation and “browning” of white adipose tissue (WAT) can result in increased energy expenditure in mice by uncoupled respiration (thermogenesis), and targeting BAT and/or browning of WAT might prove a potential strategy for the treatment of obesity and related metabolic disorders in humans . In this context, the activation of the sympathetic nervous system by cold or overfeeding induces the thermogenic activity of BAT by the activation of uncoupling protein 1 (UCP1) and by increasing the supply and oxidation of metabolic substrate to sustain thermogenesis . Various other factors and signaling pathways, such as the hepatic factor fibroblast growth factor 21 (FGF21) or bile acid-mediated activation of the G protein-coupled bile acid receptor (TGR5) can activate BAT or induce browning of WAT, and alternatively activated M2 macrophages can control BAT thermogenesis via local release of catecholamines [17–19]. In recent years, both the cold-induced thermogenesis and the diet-induced thermogenesis (DIT) have been studied increasingly also at molecular level. Mechanisms of DIT include uncoupling of mitochondrial respiration through UCP1, but also the activation of futile metabolic cycles, whereby PUFA are particularly effective in recruiting brown/beige adipocytes . Emerging evidence suggested that a fish oil diet, rich in n-3 PUFA, promotes BAT thermogenesis [21, 22], although the underlying mechanisms remain poorly described . The observed phenotypes and the impact of interventions from diet-induced obesity (DIO) mouse models however are sometimes controversial across studies due to the lack of a standardized defined high-fat diet (HFD) for modeling DIO. This makes it also difficult to compare the data of the studies. The importance of source and type of dietary fat for the regulation of metabolic pathways has been shown by nutrigenomic research demonstrating the differential impact of dietary fatty acids and triglycerides on gene regulation via peroxisome proliferator-activated receptor α (PPARα) [24, 25]. Thus, we previously established a DIO mouse model using defined soybean/palm oil-based diets . Compared to the control diet C (13 kJ% fat), isocaloric HFDs (48 kJ% fat) - HF, and n-3 LCPUFA-enriched HFD (HF/n-3) - were characterised by differential fat quality and unbalanced n-6/n-3 PUFA for C (9.85) and HF (13.5) and balanced n-6/n-3 PUFA for HF/n-3 (0.84). Interestingly, after 12-week feeding, HF/n-3 mice compared to HF mice showed reduced body weight and fat mass, lower hepatic triacylglycerol (TAG) and plasma non-esterified fatty acids (NEFA) levels, although they ingested more and excreted less energy than HF mice. In addition, differential metabolic and inflammatory responsiveness to diets of visceral adipose tissues and increased UCP1 mRNA levels in interscapular brown adipose tissue (iBAT) were observed . To explain these observed anti-obesogenic effects, we hypothesised that compared to HF mice, HF/n-3 mice have the potential for (1) altered lipid handling, either by diminished de novo lipogenesis (DNL) and/or increased fatty acid oxidation in the intestine, liver, and iBAT, and (2) increased DIT in iBAT. Consequently, the aim of our study was to analyse the expression changes in key genes and proteins involved in these metabolic and inflammatory processes and their regulation with a main focus on iBAT. Organs and tissues were used from mice of our previous feeding study as described in detail in Ludwig et al. . In brief, for the 12-week feeding trial, the 8-week old male C57BL/6J mice, housed under specific-pathogen-free conditions and with ad libitum access to food and water, were randomly assigned to three dietary groups (n = 12 mice/group): control diet (C) with 13 kJ% fat and the isocaloric HFDs with 48 kJ% fat, HF and n-3 LCPUFA-enriched HFD (HF/n-3). All diets (C, cat. no. S5745-E720; HF, cat. no. S5745-E722; HF/n-3, cat. no. S5745-E725) were purified experimental diets manufactured as pellets by Ssniff Spezialdiäten (Soest, Germany). Diet compositions are shown in Table 1 and diet fatty acid patterns in Additional file 1: Table S1. All experimental procedures were conducted according to the German guidelines on animal care and handling and were approved (permission no: 55.2–1–54-2532-113-11) by the Governmental district of Upper Bavaria (Oberbayern), Germany. At the end of the feeding period, animals were euthanized in the postprandial state. Amongst other tissues, liver, intestinal mucosa [mucosal scrapings of the upper and lower small intestine (USI and LSI)] and iBAT were sampled, weighed, snap frozen in liquid nitrogen and stored at − 80 °C or further processed for histological procedures. RNA and protein extractions were performed as previously described in detail . In brief, after tissue homogenization with Qiazol lysis reagent total RNA was extracted with chloroform, purified using the mRNeasy mini kit (Qiagen, Hilden, Germany) and further processed (on-column DNase I digestion, quantity and quality measurement). Extraction of total protein from tissues was performed in the presence of proteinase and phosphatase inhibitors (Sigma-Aldrich, Taufkirchen; Roche, Mannheim, Germany). Protein concentration was determined by bicinchoninic acid method (Pierce Thermo Scientific, Bonn, Germany). Expression of specific target genes was evaluated with real-time quantitative polymerase chain reaction (RT-qPCR). For each sample, 10 ng of extracted RNA was used per reaction using the QuantiTect quantitative, real-time one-step RT-PCR kit (Qiagen, Hilden, Germany), following the supplier’s protocol. Primers and commercially available primer assay are listed in the Additional file 1: Table S2, S3. RT-qPCR was performed using SYBR Green I dye and a Mastercycler ep realplex4 S (Eppendorf, Hamburg, Germany), as described earlier . The ΔΔCq method was applied for analysis . To normalise the data the following genes were used as invariant controls. iBAT: cyclophilin B (Cypb) and heat shock protein 90 (cytosolic) and class B member 1 (Hsp90αb1); liver: hypoxanthine-guanine phosphoribosyltransferase1 (Hprt1) and β-actin (Actb); USI: glyceraldehyde-3-phosphate-dehydrogenase (Gapdh), Actb and Hprt1; LSI: Cypb and Hsp90αb1. For all groups, data were expressed as means ± standard error of the means (SEM) relative to control samples. TAG were extracted as follows. Grounded tissues were homogenised in HB-buffer [10 mM NaH2PO4, 1 mM EDTA, 1% polyoxyethylen (10) tridecyl ether]. Supernatents were collected after centrifugation (4 °C; 23,100 g; 15 min) and incubated for 5 min at 70 °C. After incubation on ice for 5 min and centrifugation (4 °C; 23,100 g; 15 min) the TAG concentrations were determined in the samples using a serum triglyceride determination kit (Sigma-Aldrich, Taufkirchen, Germany), following the manufacturer’s instructions. Results were normalised to total weight and total protein content of the tissue (determined by bicinchoninic acid method). Equal amounts of protein (30–80 μg/lane) were resolved by a 7.5, 10 or 12.5% SDS-PAGE. Subsequently, proteins were transferred to a nitrocellulose membrane using a Tankblot Eco-Mini system (Biometra, Göttingen, Germany) and further processed as described previously . Primary antibodies for antigen detection are listed in the Additional file 1: Table S4. IRDye800CW-conjugated goat anti-rabbit secondary antibody or IRDye680RD-conjugated donkey anti-mouse secondary antibody were applied for visual detection using the Odyssey Infrared Detection system (LI-COR Biotechnology, Bad Homburg, Germany). β-ACTIN or HSP90 expression served as invariant controls. Recruitment of iBAT was calculated as UCP1 content in total iBAT: [UCP1 expression * dilution factor for protein content * (total iBAT in mg / weighed portion of iBAT for protein isolation in mg)] (normalised values were used). Relative UCP1 capacity index was calculated as follows: [(relative protein expression * total iBAT tissue (mg))/body mass (mg)] * 100%. For immunohistochemistry, 6-μm-thick paraffin tissue sections (n = 5/group, in duplicates) were dewaxed and stained with specific primary antibodies (Additional file 1: Table S4), and further processed as previously described . Photographs at × 400 magnification are used for composite and close-ups from representative cluster of macrophages (MCL), similar to CLS, which were recently also described in BAT , were taken at × 630 magnification. MCL was described as at least three positively stained cells surrounding a lipid droplets containing cell. MCL density was defined as number of MCL per total section area (mm2). Hematoxylin and eosin-stained paraffin sections were used to analyse iBAT tissue morphology. All data were expressed as means ± SEM. Statistical analyses were performed using Prism 5 (GraphPad Software). Differences were considered statistically significant with * p < 0.05, ** p < 0.01, *** p < 0.001 compared to control group or high-fat groups. For normal distributed samples, one-way ANOVA was used to detect differences between dietary groups with Tukey’s post-test to identify significant differences. In case of no normal distribution or n < 5, Kruskal-Wallis test and Dunn’s post-test were applied. In addition, outliers were detected by using Grubb’s test (GraphPad Software) and excluded from analysis. For immunohistochemical analyses, the detection of positive-stained cells were made in duplicates and mean values were used for statistical analyses. Pearson correlation coefficient (r) was employed to investigate correlations (two-tailed test) and tests for linear trend were calculated by using linear regression models. mRNA levels of proteins involved in mitochondrial and peroxisomal β-oxidation and in ω-oxidation were analysed separately in the upper and lower small intestine (USI and LSI). The expression levels of these genes were significantly increased in the USI for both high-fat groups, whereas significantly higher levels were detected for HF/n-3 than for HF (Fig. 1a). For LSI, these genes were only significantly upregulated upon HF/n-3, except for cytochrome P450, family 4, subfamily a, polypeptide 10 (CYP4a10; ω-oxidation). This gene showed the highest fold changes, and was also significantly higher expressed for HF than for C (Fig. 1b). For liver, CYP4a10 expression was also significantly increased for both HFDs compared to control. However, the difference (2.53-fold) between HF/n-3 and HF was lower as the intestinal expression (USI: 6.08-fold; LSI: 8.63-fold). In addition, the mRNA expression for enoyl-Coenzyme A hydratase (LPBE; peroxisomal β-oxidation) was significantly higher and for acetyl-CoA carboxylase 2 (ACC2; DNL) was significantly lower in the HF/n-3 group than for control and HF group (Fig. 1c). Hepatic DNL was further characterised by examining protein expression of cellular energy sensor AMP-activated protein kinase α (AMPKα, Fig. 2a) and ACC1_2 (Fig. 2b), since activated AMPK (pThr172-AMPKα) can phosphorylate ACC1 and 2 on pSer79-ACC1 and pSer219/Ser221-ACC2, respectively, and inhibit DNL . Compared to controls, in HF mice total AMPKα was significantly decreased, whereas the p-AMPKα/AMPKα ratio was significantly increased. A similar tendency for p-AMPKα/AMPKα ratio was also observed upon HF/n-3. Moreover, hepatic levels for total ACC1_2 were significantly reduced in both high-fat groups, with a stronger downregulation for HF/n-3 than for HF. Levels for p79-ACC1 were only significantly reduced for HF/n-3 compared to control, whereas pSer219/Ser221-ACC2 levels were significantly lower for HF/n-3 than for control and HF. Interestingly, the ratios pSer79-ACC1/ACC1_2 and pSer219/pSer221-ACC2/ACC1_2 were not significantly different between the groups. Thus, our data suggest that hepatic DNL is diminished upon chronic feeding of HF and HF/n-3 by down-regulation of ACC1_2 protein expression and exlude the possibility that ACC1 and 2 are inactivated by a sharp increase of phosphorylated ACC1 and 2 levels upon activated AMPK (pThr172-AMPKα). As previously reported, chronic feeding of HFDs significantly increased iBAT mass compared to control and regardless of fat quality , whereas TAG content in total iBAT as well as amount of TAG/gram of protein showed only a significant increase for the HF mice (Table 2). Noteworthy, for HF compared to control, in iBAT the protein content (protein amount/iBAT mass) was significantly lower. Brown adipocyte number, the mitochondrial density, and the amount of UCP1 define thermogenic potential of iBAT, but adipose tissue vascularisation makes also its contribution . Analysing iBAT morphology, surprisingly, for both high-fat diets increased lipid droplet size was observed (Fig. 3a). Importantly, however, levels of the mitochondrial proteins UCP1 and citrate synthase (CS) were significantly elevated for HF/n-3 compared to control and HF, whereas they were not significantly different between HF and C (Fig. 3b). However, considering differences in iBAT and body mass between dietary groups in relation to UCP1 and CS expression, both protein levels were significantly higher for HF than for C, and for HF/n-3 they remained significantly elevated compared to HF and C (Fig. 3c). Finally, calculated UCP1 content for total iBAT (see Methods) and mRNA levels for the peroxisome proliferator-activated receptor γ coactivator 1-α and-β (PGC1A and PGC1B; ) were significant higher for HF/n-3 than for HF and control (Fig. 3d, e). These data indicate lower mitochondrial density for the HF mice compared to HF/n-3 mice. Furthermore, mRNA levels for the endothelial cell marker cadherin 5 (CDH5) were significantly elevated for both HFDs compared to control (Fig. 3e). Activation of the sympathetic nervous system induces the thermogenic activity of BAT by activating UCP1 and increasing the supply and oxidation of metabolic substrates to sustain thermogenesis . To examine whether the observed increased lipid storage in iBAT upon HFDs can be explained by potential differences in lipid handling, we measured the expression of genes operating in fatty acid uptake and oxidation, TAG storage, lipolysis and DNL, as well as glucose uptake or glycolysis (Table 3). In addition, as shown in Fig. 4, lipolysis and its stimulation by catecholamine, which activates beta-adrenergic receptors (ADRB), were further assessed by expression analyses of ADRB, hormone sensitive lipase (HSL), adipose triglyceride lipase (ATGL) and lipase activity control. Phosphorylation of HSL on Ser660 or Ser563 activates lipolysis, whereas Ser565 phosphorylation inhibits lipolysis by downregulating Ser563 phosphorylation . A heat-map-like presentation of data for the targeted mRNA expression analyses is shown in Table 3. Lipoprotein lipase (LPL) and fatty acid translocase (CD36) mRNA were significantly increased for HF/n-3 compared to control, and LPL levels were even significantly higher for HF/n-3 than for HF indicating increased lipid uptake in iBAT. 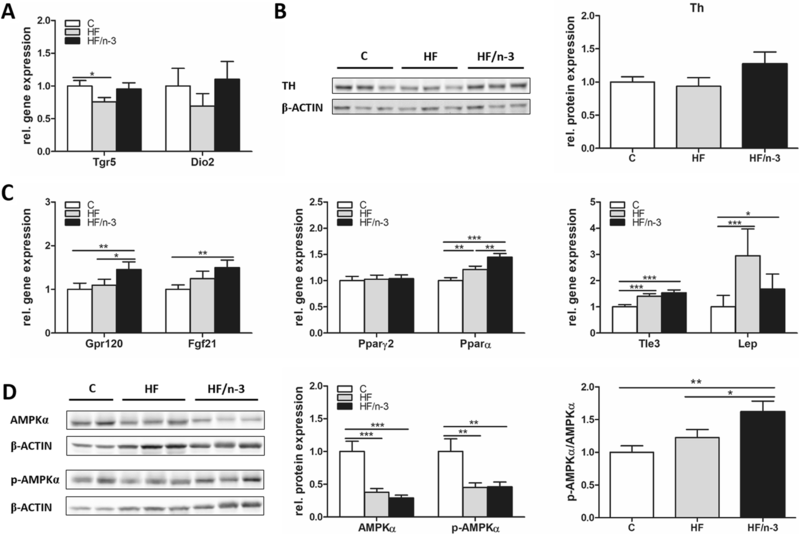 Expression for fatty acid binding protein 3 (FABP3), carnitine palmitoyl transferase 1a (CPT1a) and the NAD(P)H oxidase subunit p47PHOX was significantly upregulated for HFDs compared to controls, whereby the significantly higher FABP3 level for HF/n-3 represents the second highest change between HFDs. In addition, the CS expression was also significantly elevated for HF/n-3 compared to control and HF. Glucose transporter 4 (GLUT4) mRNA was significantly reduced for HF/n-3 and HF compared to control, and GLUT4 levels were even lower for HF/n-3 than for HF. GLUT1 mRNA expression showed no regulation and hexokinase 2 (HK2) levels were significantly decreased upon HF/n-3 compared to control. With regard to lipid storage, for HF/n-3, significantly elevated mRNA levels for glycerol kinase (GYK) and lactate dehydrogenase (LDHB) were detected compared to HF, whereas for GYK (highest change between HFDs), 1-acylglycerol-3-phosphate O-acyltransferase 9 (AGPAT9) and diglyceride acyltransferase 2 (DGAT2) levels were higher for HF/n-3 than for control. DGAT2 mRNA was even significantly elevated upon HF/n-3 compared to HF, whereas DGAT1 levels were significantly lower for HF than for control. Significantly decreased ACC1 and ACC2 expression was detected for both HFDs compared to control, and levels were substantially lower for HF/n-3 than for HF. Lipolysis in iBAT was further explored as shown in Fig. 4. A significant upregulation of ADRB3 mRNA levels was found for HF compared to HF/n-3, whereas ADRB1 was not regulated (Fig. 4a). HSL mRNA levels were not changed (Table 3). However, compared to controls, protein expression for HSL and ATGL as well as for phosphorylated HSL p660-HSL and p565-HSL was significantly reduced upon HF and HF/n-3 (Fig. 4b, c), whereas p563-HSL was only significantly lower for HF/n-3 but not for HF. For the ratios p660-HSL/HSL and p565-HSL/HSL, they were significantly lower for HF/n-3 than for control, whereas the ratio p563-HSL/HSL for HF/n-3 was significantly reduced compared to HF (Fig. 4c). 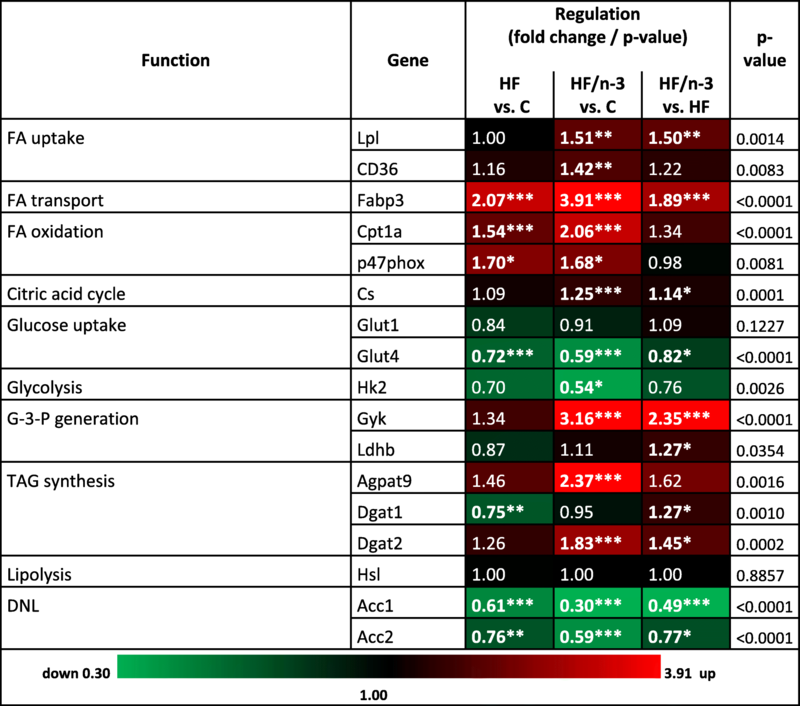 Taken together, although the data indicated that the free fatty acids (FFA) supply for mitochondria seems more likely be sustained by increased lipid uptake than TAG lipolysis in HF/n-3 mice, correlation analyses showed significant correlations between the gene expression levels of DGAT2 and HSL (r = 0.6377, p = 0.0473) in HF/n-3 mice pointing to a dynamic interplay between TAG synthesis and hydrolysis upon HF/n-3. To further identify regulatory mechanism involved in the promotion of iBAT activity and energy expenditure, we focused on catecholamine-mediated activation of β-adrenergic receptor signaling, and adrenergic-independent brown fat activator pathways  - TGR5–Iodothyronine 5′-deiodinase (DIO2) and G protein-coupled receptor (GPR120)-FGF21 [18, 32] as well as signaling pathway interaction of eosinophils and macrophages [19, 33] and corresponding enzyme tyrosine hydroxylase (TH; [19, 34]). Moreover, the metabolic hormone FGF21  and key metabolic regulators - the transcription factors PPARα and γ2 [36, 37] and transducin-like enhancer of split 3 (TLE3; ), leptin (LEP) and AMPKα  - were analysed in iBAT. In contrast to our finding for ADRB3, TGR5 mRNA levels were significantly reduced for HF compared to control in iBAT. DIO2 mRNA levels were not regulated (Fig. 5a) and TH protein expression was only slightly higher for HF/n-3 than for control (Fig. 5b). mRNA levels for GPR120, FGF21, PPARα, TLE3 and LEP were significantly elevated for HF/n-3 compared to controls, whereas only PPARα, TLE3 and LEP showed significant higher levels for HF than for controls. Expression levels of GPR120 and PPARα were even significantly higher for HF/n-3 than for HF, whereas PPARγ2 was not regulated (Fig. 5c). Finally, significantly reduced protein expression levels for total AMPKα and p-AMPKα were found in both HFD groups compared to controls. However, the ratio was only significantly increased for HF/n-3 compared to control and HF (Fig. 5d). To further explain the different phenotypes of iBAT and the functional state of iBAT upon differential diets, we performed correlation analyses. Significant or nearly significant correlations were found in the HF/n-3 group between the mRNA levels of PPARα, GPR120 or FGF21 and UCP1, whereas for the HF group, a significant positive correlation was observed between the mRNA levels of FGF21 and UCP1, however, also negative correlations were found between the mRNA levels of TLE3 and UCP1 (Additional file 1: Table S5). Considering FGF21 as an upregulated downstream target upon PPAR activation  and as activator of several downstream signaling pathways including AMPKα , FGF21 might be involved in the observed positive regulation of energy metabolism in HF/n-3 mice. Significant correlations between the mRNA levels of FGF21 and ADRB1, CD36 or DGAT1 were measured within all groups (Additional file 1: Table S6A). Moreover, especially within the HF/n-3 group, significant or nearly significant correlations were observed between (1) the mRNA levels for ADRB1, CD36 and DGAT1 (Additional file 1: Table S6A), and (2) between ADRB1, CD36 and DGAT1 mRNA levels and mRNA levels of almost all other analysed enzymes involved in energy metabolism (Additional file 1: Table S6B). Given that certain immune cells might help to sustain adaptive thermogenesis [19, 33], whereas inflammation could downregulate the activity of iBAT , we examined immune cell infiltration and inflammation in iBAT. Adipose tissue macrophages were identified by the macrophage marker F4/80, encoded by mucin-like, hormone receptor-like sequence 1 (EMR1), and were classified according to their state of activation/polarization into the pro-inflammatory M1 macrophages and anti-inflammatory M2 macrophages. Integrin alpha X (ITGAX), mannose receptor, C type 1 (MRC1), and C-type lectin domain family 10, member A (CLEC10a), are known to encode CD11c (marker for M1 macrophage subset), CD206 and CD301 (markers for M2 macrophage subset), respectively [19, 41]. In iBAT, the gene expression levels of these markers (Fig. 6a) as well as their immunohistochemical detection (Fig. 7), and quantification of clusters of accumulated macrophages (MCL) surrounding adipocytes (Fig. 6b), in analogy to CLS in WAT, or as solitary cells (Fig. 6c) were examined. Moreover, the mRNA levels of pro- and anti-inflammatory markers (Fig. 6d) and sialic acid binding Ig-like lectin 5 (SIGLEC5; Fig. 6e) as eosinophil-specific marker  were determined. Significantly higher mRNA levels for EMR1, but also for ITGAX and CLEC10a were detected upon both HFDs compared to control, whereas MRC1 level was only significantly increased upon HF/n-3 (Fig. 6a). Comparing immunohistochemical analyses of iBAT to visceral white adipose tissues, accumulated macrophages in iBAT form clusters without obvious CLS morphology as described in visceral adipose tissues , nevertheless CLS were described recently also in BAT . Thus, we defined the accumulated macrophages in iBAT as cluster of macrophages (MCL). As shown in Fig. 6b, surprisingly, for all groups the CD301-positive stained MCL were more frequent than MCL stained positively for other applied macrophage markers, whereby CD301-positive stained MCL were significantly less upon HF compared to control. However, the number of CD11c- or CD206-positive-stained MCL was not different between diets. Notably, the most obvious changes were observed for F4/80-positive MCL, which were significantly more frequent upon HF/n-3 than upon HF. 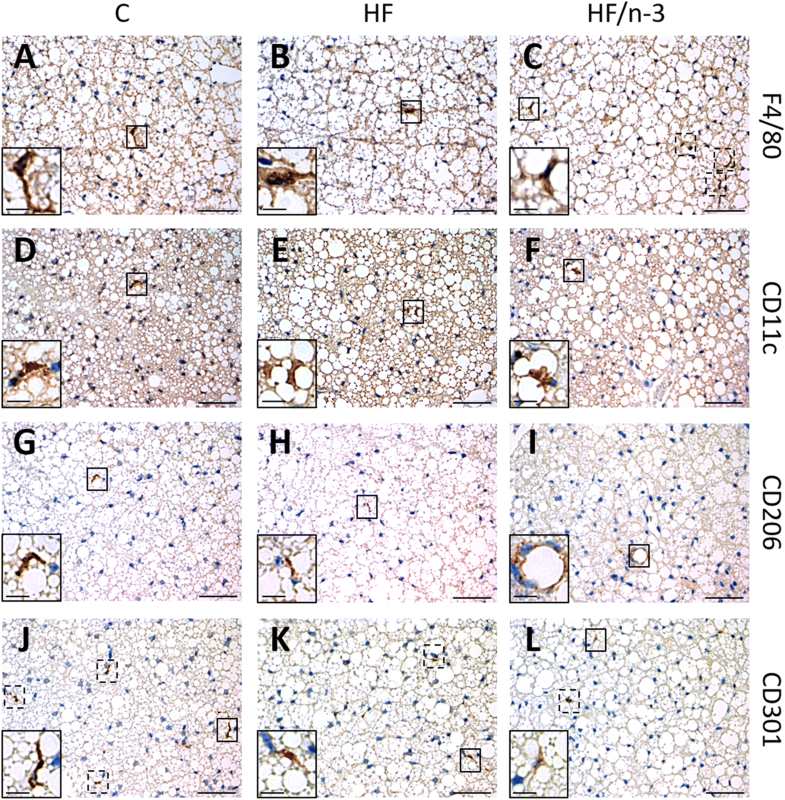 The results of the solitary cell counts were similar to those of the positive-stained MCL, with more F4/80-positive and CD11c-positive solitary cells upon HF/n-3 than HF, but the number of CD301-positive solitary cells was significantly downregulated in both high-fat groups compared to control group (Fig. 6c). Besides that, the gene expression level of monocyte chemoattractant protein-1 (MCP1) was significantly higher for HFDs than control, whereas the pro-inflammatory marker tumor necrosis factors α (TNFα) showed no regulation. However, mRNA levels of the anti-inflammatory markers interleukin-10 (IL-10) and transforming growth factor β1 (TGFβ1) were significantly higher for HF/n-3 than for controls but upon HF only IL-10 levels were significantly elevated compared to control (Fig. 6d). Given the involvement of M2 macrophages and eosinophils in thermogenesis, the mRNA abundance of the eosinophil-specific marker SIGLEC5 was determined and a correlation-based approach was applied to examine a possible correlation between the abundance of immune cells and the thermogenic marker UCP1. Notably, the mRNA level of SIGLEC5 was significantly enhanced for the HF/n-3 mice compared to control and HF mice (Fig. 6e) and, within the HF/n-3 group, SIGLEC5 was significantly correlated with the gene expression levels of EMR1, MCR1 and CLEC10a, and even UCP1 (Additional file 1: Table S8). In addition, significant correlations were also found between the gene expression levels of GPR120 and EMR1, CLEC10a or SIGLEC5 (Additional file 1: Table S8). In the current study we assessed the previously observed anti-obesogenic effects of chronic HF/n-3 feeding  based on our hypothesis that HF/n-3 induces the expression of genes involved in energy dissipating metabolic pathways and/or thermogenesis resulting in increased energy expenditure and reduced fat mass in mice. The main findings from our analyses of the intestine, liver and iBAT suggest diminished DNL, enhanced combustion of fatty acids and more coordinated regulation of energy metabolism upon HF/n-3 compared to HF. In particular, HF/n-3 activates less efficient pathways, such as ω-oxidation and peroxisomal β-oxidation, for energy production in the intestine and the liver and increases ATP consumption upon the induction of a TAG / FFA cycle in iBAT. In addition, iBAT from HF/n-3 mice manifest increased thermogenic and oxidative potential. To our knowledge the induction of a TAG/FFA cycle in iBAT tissue is shown the first time by our study. Finally, we characterised transcriptional regulatory pathways and AMPKα as targets for possible underlying mechanisms of n-3 LCPUFA, whereby FGF21 might mediate the metabolic effects of HF/n-3 in iBAT, and the increase in rather anti-inflammatory macrophages and eosinophils can be associated with lipid buffering and even thermogenesis in iBAT. Previous in-vivo studies already proposed that n-3 LCPUFA can reduce HFD-induced obesity and hepatic fat accumulation by targeting transcriptional regulatory networks and regulating genes involved in hepatic  and intestinal  lipid metabolism. Our findings are in line with these reports. HF/n-3 upregulated PPARα target genes involved in fatty acid oxidation, whereby the ω-oxidation gene CYP4a10 showed the highest fold change. Furthermore, the prominent activation of ω-oxidation and peroxisomal β-oxidation is consistent with dietary n-3 LCPUFA enrichment and with previous findings from fish oil-based HFDs . Notably, since peroxisomal β-oxidation itself generates heat instead of ATP due to lack of an electron transport system , the enhanced peroxisomal fatty acids turnover upon HF/n-3 may partly explain our data on higher energy expenditure and the prevention of excessive hepatic lipid deposition in HF/n-3 mice . Surprisingly, hepatic CPT1a was not induced upon HF/n-3 , questioning whether PPARα-modulated carnitine acyltransferase is the rate limiting step of mitochondrial β-oxidation in circumstances where long-chain fatty acids are preferentially channeled into peroxisomes for oxidation . Moreover, given the role of malonly-CoA, the product of ACC2, and of AMPK in the control of CPT1 , our data do not support an obvious role of the AMPK-ACC2-CPT1 axis in providing a flux control over mitochondrial β-oxidation. The lower hepatic ACC1 and ACC2 levels upon HFDs in our study and also in a study using beef tallow-based HFD  indicate reduced hepatic DNL and may reflect a long-term adaptation to HFDs, although the extent of the expression changes might depend on PUFA, fat and carbohydrate content of the diet . Moreover, metabolic improvements upon FGF21 administration were recently associated with reduced expression of ACC1 and ACC2 in liver, reducing lipogenesis and enhancing lipid oxidation independent of AMPK-dependent phosphorylation of ACC [47, 48]. Increased iBAT mass, UCP1 content, and mitochondrial and vascular density found in iBAT from HF/n-3 mice resemble features of cold-induced iBAT activation  and are in line with the report of Bargut et al. showing increased thermogenesis in iBAT upon fish oil-based HFD. Most importantly, although increased iBAT mass was detected for both HFDs, only HF/n-3 mice showed increased levels for UCP1, CS, PGC1α, and PGC1β in iBAT. In contrast, HF mice however had lower protein content and expressed elevated TLE3 levels in iBAT, known to antagonise thermogenesis . These data suggest higher mitochondrial densities and thermogenic capacity in iBAT upon HF/n-3, whereas, the increased iBAT mass of HF mice may be related to lipid accumulation due to the lower oxidative potential or dysfunctional lipid metabolism. Furthermore, Chau et al. indicated that FGF21 regulates mitochondrial activity and enhances oxidative capacity through an AMPK-SIRT1-PGC1α-dependent mechanism in adipocytes . The presented data indicate for the first time, that besides UCP1 protein expression a second thermogenic pathway that relies on futile cycling of TAG was induced upon HF/n-3 in iBAT. Recent studies already suggested for WAT the involvement of a futile substrate cycle based on TAG lipolysis and energy demanding re-esterification as an UCP1 independent anti-obesity effect of n-3 LCPUFA [12, 49]. Moreover, it was suggested that FGF21 corrects obesity in mice partly by promoting futile cycling in adipose tissue . Notably, the TAG/FFA substrate cycling in adipose tissues creates an efficient buffer system that provides fatty acids in time of metabolic need, thus allowing sufficient fatty acid flux without non-physiological increase in cellular NEFA . It should be noted that long-chain acyl-CoA themselves can modulate fatty acid supply via feedback inhibition of lipolysis . For HF/n-3 mice, our data indicated that the supply of FFA for mitochondria seems more likely be sustained by increased lipid uptake (LPL and CD36) than lipolysis of TAG, but they also indicated subsequent efficient fatty acid oxidation (CPT1a, PPARα, FABP3 ), and ultimately enhanced lipid turnover, as well as a balanced energy metabolism (Table S6B). Moreover, our indication of HF/n-3-induced futile cycling of TAG in iBAT is supported by the observed significant correlations between lipolysis (HSL) and fatty acid re-esterification (DGAT2) and measured upregulation of GYK expression  upon HF/n-3. Furthermore, our expression data are consistent with an increase in fatty acid uptake (LPL and CD36) and storage (GYK and LDHB), TAG synthesis (DGAT1, DGAT2, AGPAT9), as well as a balanced energy metabolism. Considering the importance of sympathetic activity for increased energy expenditure in BAT, our data do not a priori show reduced sympathetic activity upon HF/n-3, a condition that could finally prevent increased energy expenditure, despite of enhanced UCP1 levels. Our findings are therefore not consistent with the observed effect of a PPARγ agonist on BAT sympathetic activity described by Festuccia et al. . However, our data on the adrenergic-independent brown fat activator pathway GPR120-FGF21 [18, 32] point to an activated state upon HF/n-3. This data together with the increased TH protein level and the higher abundance of eosinophils and type 2 macrophages indicate a higher iBAT sympathetic nerve activity and thermogenic function in HF/n-3 mice. This is consistent with reports showing beneficial effects of n-3 LCPUFA on the autonomic nervous system  and of immune cells on brown adipocyte activity upon cold [19, 33]. However, the latter was questioned recently by Fischer et al. . Nevertheless, for the HF/n-3 group, our data point to a connection between alternatively activated macrophages, eosinophils and the expression of thermogenic genes regulated via GPR120 signaling in iBAT. Furthermore, both the higher macrophage abundance and the elevated directed lipid uptake in iBAT upon HF/n-3 could have contributed the previously observed lower plasma NEFA levels in HF/n-3 mice . We observed the activation of PPARα and AMPKα as potential targets in HF/n-3 iBAT, whereby the HF/n-3-induced increase in FGF21 and immune cells might mediate changes in the expression of enzymes related to energy metabolism and/or be involved in the regulation of iBAT activity, respectively [19, 32, 33, 39, 47, 48]. As noted above, the mere enhanced UCP1 levels upon PPARy agonist cannot enhance energy expenditure . However, the induction of PPARα can contribute to thermogenic activation of BAT by coordinately regulating lipid catabolism and thermogenic gene expression via induction of PGC1α . Our data indicated this effect in iBAT from HF/n-3 mice, showing that PPARα activation participates in UCP1 expression. Moreover, the observed elevated levels for GPR120 and FGF21 upon HF/n-3, implicate GRP120 to exert a dual role [32, 55], connecting inflammation and metabolism in iBAT. Finally, our findings suggest that n-3 LCPUFA exert their favorable effects counteracting on obesity by targeting distinct pathways, such as PPARα and AMPKα in iBAT, but also in liver and small intestine, thereby increasing energy expenditure, whereby FGF21 as downstream target of PPARs reflects the activation of PPARα by n-3 PUFA and the activation of several downstream signaling pathways including AMPKα [35, 39]. There are some limitations of our study which should be considered. In general, although major parts of the lipid metabolism appear to be conserved between mice and humans, differences exist regarding the regulation of triglyceride levels via apolipoproteins such as APOA5  or the target genes of PPARα, the master regulator of hepatic lipid metabolism . Moreover, similarities and differences in BAT between mice and humans relating to metabolism and thermogenesis as well as their underlying mechanisms of regulation are still not well understood. These limitations should be taken into account when extrapolating from mice to humans findings on metabolic disease processes such as hypertriglyceridemia, fatty liver and obesity or cardiovascular diseases. Our observed expression changes are consistent with either n-3 LCPUFA-mediated induction and/or reduced n6/n3 PUFA ratios, however we can not completely ruled out, that reduced levels of SFA and/or MUFA in the HF/n-3 diet due to replacement with n-3 LCPUFA may also have contributed to these changes; considering SFA are likely more obesogenic than MUFA and PUFA, whereas unsaturated fat, MUFA and PUFA, appear to be more metabolically beneficial . To counteract obesity by balancing the n-6/n-3 PUFA ratio, we used high levels of n-3 PUFA (10.4 kJ%), which are similar high as in other murine DIO models using fish-oil based diets (e.g. Bargut et al. ). However these doses should be considered with caution with regard to human dietary recommendations for adults (n-3 PUFA 0.5–2 kJ%; Additional file 1: Table S1) and clinical trials [59–61]. Moreover, the role of supplementation with LCPUFA considering the identification of population-related genetic variants in the LCPUFA biosynthetic pathway  is not clear and needs more research efforts addressing gene-PUFA interactions relating differently the risk of diseases. Regarding the translation of n-3 PUFA effects from mice to humans in the context of energy expenditure, Fan et al. recently stated that the evidence on thermogenic function of n-3 PUFA in human clinical trials, mostly fish oil supplementation, remains inconclusive, whereas strong correlations between fish oil intake and reduced visceral adiposity were found. So far, this appears to originate from the confounding factors of study design, technical difficulties in BAT identification, as well as lack of access to human brown/beige fat tissue samples from clinical trials to study the underlying mechanisms of n-3 PUFA effects in BAT. Overall, manipulation of dietary fat quality by n-3 LCPUFA enrichment and balancing n-6/n-3 PUFA ratio seems a possible avenue for positive modulation of energy metabolism and immune cells in obese mice. Our findings are based on expression and biochemical data combined with correlation analyses, therefore in future experiments physiological and metabolic validations of our data on the induction of energy dissipating pathways by n-3 LCPUFA underlying the anti-obesogenic effects are necessary. Additionally, a more complete understanding of the various doses and individual effects of the n-3 LCPUFA EPA and DHA and/or their metabolites in physiological and pathological processes of white and brown adipose tissues in mice and humans is vitally necessary. Taken together, more future research will be ultimately required before translating discoveries from mouse models, clinical trials, and target pathways into recommendations for human intake of n-3 LCPUFA as preventive strategy or even as combination therapy for obesity or other disease processes. We appreciate the technical assistance of Ruth Hillermann for immunohistochemistry. SW was supported by the German Research Foundation (Deutsche Forschungsgemeinschaft, DFG) as part of the Research Training School GRK 1482/2. BLB designed and supervised the animal study; SW and BLB planned and SW conducted the biomolecular experiments; MK supervised and contributed to interpretation of the immunohistochemical analyses; SW and BLB analysed the data; HH contributed to the interpretation of the results; SW and BLB wrote the manuscript. All authors read and approved the final manuscript. All experimental procedures were conducted according to the German guidelines on animal care and handling and were approved (permission no: 55.2–1–54-2532-113-11) by the Governmental district of Upper Bavaria (Oberbayern), Germany. Fan R, Koehler K, Chung S. Adaptive thermogenesis by dietary n-3 polyunsaturated fatty acids: emerging evidence and mechanisms. Biochim Biophys Acta. 2018. https://doi.org/10.1016/j.bbalip.2018.04.012 .